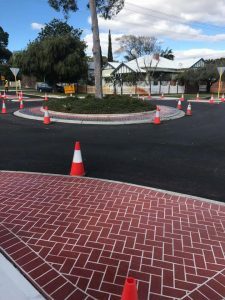 The City of Melville, located in the southern suburbs of Perth, has an ongoing maintenance upgrade program running throughout its suburbs, which includes Willagee, Alfred Cove, Bateman, Fremantle, and Riverton. Some of the upgrades slated for completion include works to the kerbing, drains, bitumen, signage, and cement resurfacing. 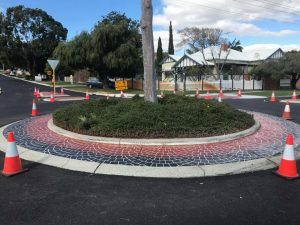 The City of Melville Council approached the team at Wespray on Paving to complete the cement resurfacing part of their local upgrade works, which entailed transforming the existing concrete islands and roundabouts from dull and lifeless, to a like new condition. One of the reasons we were approached for this job is because our spray on paving was a cost-effective way to revitalise dated concrete and paving, without the hassle of ripping up the existing structures and starting completely from scratch. This meant that not only were we the perfect fit for the job at hand; we were also one of the more affordable options. As you can see in the completed pictures, we used a 45-degree Herringbone pattern with matching headers in Sentosa red on the islands, while on the roundabouts we applied a Eurofan pattern with a charcoal outer edge. What many people don’t realise is that the charcoal outer edge is actually there to mark where larger vehicles can come up on the apron; it’s not just a decorative measure – although it does look great! To ensure the work we completed for the City of Melville will be able to stand the test of time, we also added a UV stable sealer protectant over the top of the paving to protect its bright finish. This UV stable sealer will help prevent any signs of wear and fading from the sun. Here at Wespray on Paving, we complete a lot of jobs for local councils and Government projects. To see more of our work, or to learn more about our concrete resurfacing techniques, visit us at www.wesprayonpaving.com.au today!